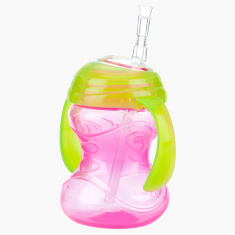 Nuby Swirls Twin Handle Flexi Straw Cup - 240 ml | Pink | Non-Spill. Your child will love drinking in this BPA-free straw cup that comes with twin handles on either side and is easy to hold. The flexible straw ensures that the liquid does not spill and provides easy sipping even while your little one is on the move.